This entry was posted in Smart Skin Blog and tagged AHA facial cream, antioxidants, oxidative stress, vitamin c. Bookmark the permalink. Follow any comments here with the RSS feed for this post. Post a comment or leave a trackback: Trackback URL. You may have heard about antioxidants while reading a cooking magazine or browsing the skincare aisle. “Antioxidant” is often a buzzword, but what does it really mean? Oxidation is a process in our bodies that leads to damage and aging of cells. Free radicals are chemicals in our body that cause the oxidation process. Our body makes free radicals in response to sunlight, food, toxins, pollution, cigarette smoke, alcohol, etc. Antioxidants work to stop free radicals from forming and break them down after they have formed. A balance between free radicals and antioxidants is needed to prevent damage to our cells. Free radicals can trigger a number of human diseases. Oxidation or “oxidative stress” has been connected to many conditions including atherosclerosis, inflammatory diseases, certain cancers, and the aging process. The key antioxidants in our body are Vitamin C, Vitamin E, and beta-carotene. Kait Matthes, PA-C, wrote a blog entry about Vitamin C and Vitamin E for our skin. Other important antioxidants include selenium, lycopene, and flavonoids. Antioxidants are found in vegetables such as spinach, broccoli, carrots, potatoes, tomatoes, and legumes. They are also found in fruits such as berries, cherries, citrus, and olives. Green and black teas have also been studied for their antioxidant properties. Many skin care products contain antioxidants. Now that you know more about antioxidants, you can look for the ingredients listed in the products. 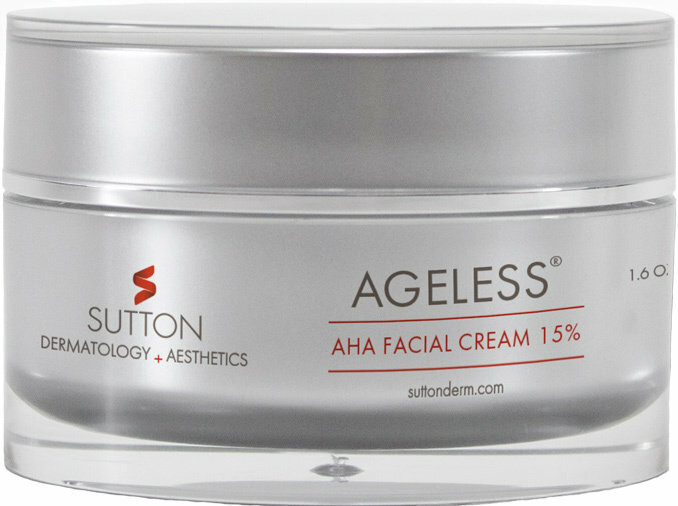 For example, the Sutton Ageless AHA Facial cream contains Vitamin C, Vitamin E, and Green tea extract. It also has coQ10 which acts as an antioxidant. Of course, it is important to help prevent oxidative stress and the formation of free radicals in the first place by limiting your exposure to damaging ultraviolet rays, cigarette smoke, and other pollutants. This article was written by Stephanie Sutton, MD, who is a contributing author to the Sutton Dermatology Blog. Stephanie Sutton is a psychiatrist and she focuses on wellness.